This week's Women of Raven Spotlight is Emily Wegner, Industrial Engineering Supervisor for Raven Aerostar. Tell us about our education and job history. I graduated from the South Dakota School of Mines & Technology (SD Mines) in 2010 with a bachelor’s of science in industrial engineering and a minor in occupational health and safety. I completed internships at Plexus in Nampa, ID and Dakota Fabrication in Harrisburg, SD. I started at Raven Aerostar in 2011 as an industrial engineer. I am currently pursuing my masters of science in engineering management at SD Mines. Tell us about your current role and responsibilities at Raven. Currently, I am an industrial engineering supervisor at Raven Aerostar. I am responsible for process development and industrial/manufacturing engineering. Our team supports the hand-off from design to manufacturing and the continuous improvement that happens on the way to our final products. I mostly work on the balloon manufacturing processes for Loon and our Thunderhead products. I also have the responsibility of program manager of parade balloon products, which has been a great experience in learning more about business. How do you use math and science in your role? I may not use Calculus III or Chemistry in my role, but I do use the basic problem-solving tools that I learned through those classes. Every day, I have the opportunity to research problems and test solutions using the scientific method. Probability and Statistics are probably the most useful classes that I have in my toolbox and use day to day. I do, however, get really excited when I have to solve a trig or geometry problem usually related our balloon or table geometry — just ask my coworkers! What inspired you to pursue this career path? When I was in middle school, I was part of a STEM camp through Girl Scouts. A local technical school hosted the camp and also offered scholarships if we decided to pursue a STEM career path. During camp we manufactured a model airplane. I remember how exciting it was to create my own Computer Numerical Control (CNC) program to etch my name into the aluminum nose of the plane. After this experience, I took on the challenge and directed my path towards engineering — even when I was one of two girls in my high school woods class. Something that someone told me when I first started at Raven was, “Your job is to work yourself out of a job." It is so rewarding to support our manufacturing team in developing easier processes and creating higher quality products every day. On top of that, I really wanted a job in manufacturing, but never thought I would be part of such an awesome mission — connecting, protecting and saving lives. What advice do you have for young women who are currently pursuing or considering pursuing a career in a STEM field? If you have an interest in STEM, go for it, and work hard. Do not be discouraged when you are the lone women in a group, class or meeting — even today, this is still my norm. Women are different than men and can bring different ideas and backgrounds to the table. When diverse groups of people are all represented and collaborate, we can expand the current knowledge in STEM. Just remember, there is a place for women in STEM. I am so honored and humbled to be featured for this celebration. There are so many awesome role models in STEM at Raven, and I am so happy to be part of the team. If you have someone in your life (daughter/son, cousin, grand-kid, friend, etc.) that you believe would be really great in a STEM field, or is just getting started in their STEM career, encourage them every day. They need it and we need them. 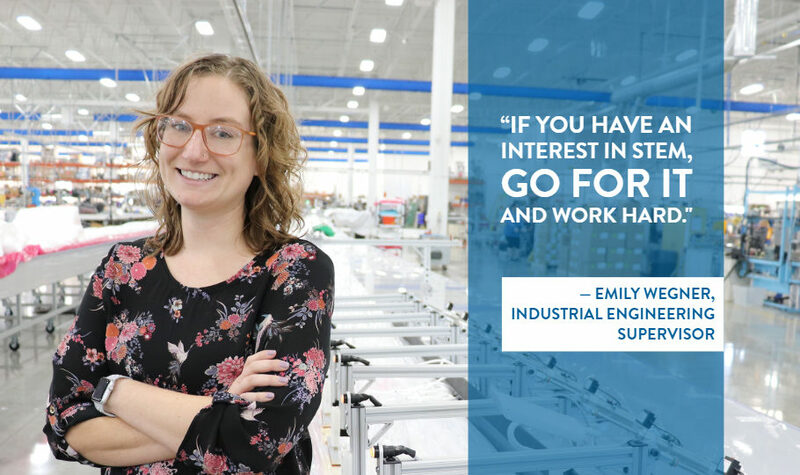 Emily Wegner shared her background and passion for STEM at the Women in Science & Engineering (WiSE) Forum at SD Mines on January 31, 2019. This forum allows students to ask relevant questions of women professionals, network, and get the encouragement they need to continue their education and success in their careers.